A new photo of Axl Rose has surfaced. 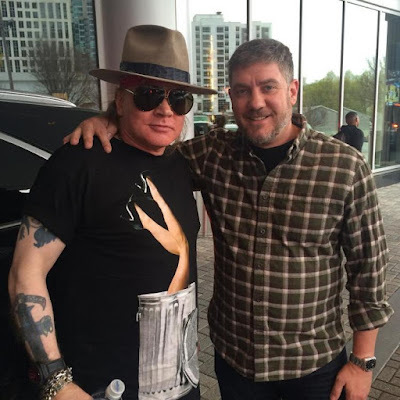 A Guns N’ Roses fan ran into the singer in front of the Loews Atlanta Hotel on Friday, and shared a photo of the chance meeting on Instagram. The partially-reunited Guns N’ Roses will perform two shows each in Las Vegas, Mexico City and at Coachella next month. To date, the group has only officially announced the involvement of Rose, Slash and Duff McKagan, but an autographed drumhead donated by the group to be auctioned off at a benefit concert last week for the people of Flint, Michigan affected by a water contamination crisis added three more names to the lineup - guitarist Richard Fortus, keyboardist Dizzy Reed and drummer Frank Ferrer. Ferrer has been GNR’s drummer since 2006, with Fortus on guitar since 2002 and Reed on keys since 1990.